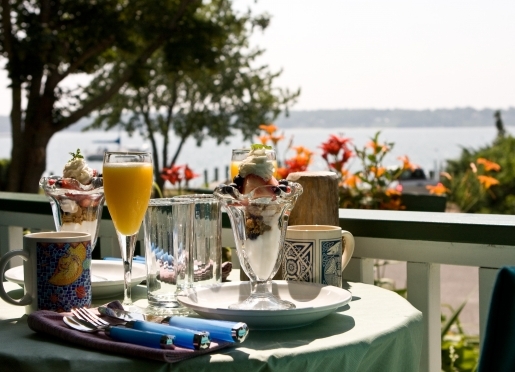 Greenport Village's premiere North Fork Bed and Breakfast fronts Greenport Harbor and Shelter Island and is located in the heart of Greenport Village's historic district. This premium B&B blends old world charm with new world state of the art Hamptons luxury. Whether you are visiting Long Island Wine Country or simply escaping New York City for a getaway, the Stirling House is the perfect choice. Europeans choose Greenport and the Stirling House to decompress on holiday...et nous parlons francais aussi. No car? No worries! We have the Long Island Railroad and our New York City "Hampton Jitney" express luxury bus terminals right in Greenport and just a short walk from the house. The Stirling House is the perfect alternative to a large hotel or a b&b in the Hamptons. Once you see the harbor from the wraparound front porch and our guest rooms (each with ensuite private bath) and once you relax in the available whirlpool tub or unwind with the New York Times in front of the fireplace, you'll think of The Stirling House first for Greenport Village and wine country accommodations. 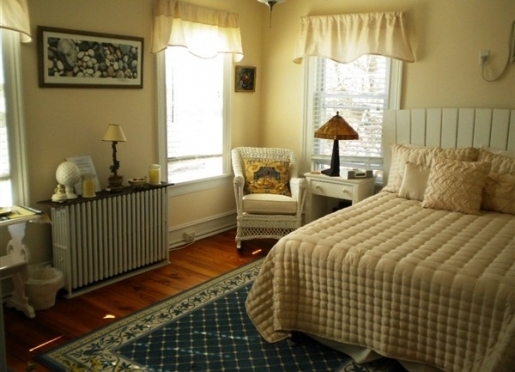 We are the longest running, continuously owned Greenport b&b for a reason...you! Celebrate your visit to Long Island's Wine Country with a premium North Fork wine! The Stirling House is licensed to serve our guests wine on premises. We can customize a wine package to meet your needs. Let us help you discover our world class wineries and vineyards with a day of wine tasting or unwind on our wraparound porch and be mesmerized by the constantly changing water views of Shelter Island. Explore quaint shops, art galleries and museums, all just a few short steps from our resort inn. Dine on fresh, bold contemporary cuisine from any of our award winning area restaurants. Breakfast is one of the highlights of your stay at The Stirling House B&B. Our full breakfast menu is created by our chef, Clayton, who recently received additional training at The French Culinary Institute in Manhattan. His "Stirling House Dutch Pancake" recipe was recently featured in Project Foodie. Request one for breakfast! We are pleased to offer all of our guests our new sunroom! more amazing waterviews through this glass room? Read, relax, dine...make it your own. Greenport's shopping and dining district only a two minute stroll away. Easily reachable from New York City, via the Hampton Jitney or LIRR, The Stirling House embraces its automobile-free, environmentally friendly guests, where your comfort is our only concern. Open year-round, our attention to detail and pampering of our guests have made our bed and breakfast a Long Island Wine Country favorite! Whether you bring or rent a bicycle and go cycling through our quaint streets or take to the water on one of our exclusive lighthouse cruises, the Stirling House will strive to make your stay an outstanding experience. Travelers are always looking for memorable and relaxing experiences. Let’s discover more through the words of our innkeepers. Many thanks to Clayton Sauer for sharing his own secrets with BBOnline.com! The three R's - Romance, returns and reputation! We are on the water and the guests love that. We are also in the heart of Long Island Wine Country's walking village, Greenport, so it is all about romance - what goes better with love than a great setting with wine? We have tremendous referrals from our past guests and so many guests return to stay. The inn is really well known for the food - especially the baked goods. B&B's really don't get the recognition of say, a restaurant, but the guests are always comparing our breakfast to the top restaurant of the East End, so that is very nice to hear. Our inn is unique because we take the lead out here, by developing getaways, such as Vine Time and Vine University. We really try to take the work completely out of the equation for our guests, so they can just relax. What I love most about the inn is our unique waterfront location. Bay Avenue is one of the nicest streets of Greenport and the views we have are unmatched. That it is a fresh, immaculate place to stay ON THE WATER. The owners try to make this as welcoming a place as possible. We know every chef at every restaurant, and every winery, so we can really help guide a guest to where they would feel most comfortable. Greenport is the heart and soul of Long Island Wine Country. This is the destination town of the North Fork. The wineries are #1; with Greenport's welcoming charm a close 2nd. The best compliment was when a group of European guests said that my croissants were the best they ever had outside of France. That one really made my day. (I learned how to make croissants and pain au chocolat in Paris, so that was a huge compliment to hear). I really appreciate when guests enjoy the food. The best kept secret in the area is the amazing biking and hiking we have as well as man y relaxing beaches. Our North Fork bike trails are flat and easy. There are many trains, including the Mashomack Preserve on Shelter Island, which is 1/3 preserve! Biking on Shelter is the opposite, as flat as it is in Greenport and the Fork, Shelter Island provides a challenging workout with its many hills. Those are not the best kept secrets...If I told you, then they wouldn't be secrets! When you are planning your itinerary, that's when I will tell you the good stuff! EVERYTHING is within walking distance. You are a two minute stroll to Main Street. Restaurants, bars, shops, museums, wine tasting, museums, boat excursions, and more are right here. Well, obviously, the best place for breakfast is right here at The Stirling House There are too many great places to name just one in Greenport. Main, Noah's and The Frisky Oyster are the top 3. The best local guide for wine is liwines.com, put out by the wine council. It has all the details about the wineries vineyards, hours, etc. Our website thestirlinghouse.com has a nice list of local things to do, etc. We love pets, but do not allow them here. We refer guests to The Orient Inn, which has 1 pet room, and there is Dog Town, a top notch doggie day (and night) care facility for pets. The Stirling House is a Green Hotel. We live right by the water and do not take it for granted that we need to be careful with the environment. We joined the New York State Department of Conservation, and are proud to be the ONLY B&B on Long Island or New York City to be awarded a 3 leaf rating, and is one of only two lodgings on Long Island to do so. The other is Gurney's Inn Resort & Spa. We are proud to be in their company, as they too are located right by the water, and appreciate the delicate balance of what we have on this planet. It is sometimes challenging to be Green in a small luxury business, but we think that Kermit may have gotten it wrong...it actually IS easy to be Green...in Greenport! We strongly encourage mass transit. Many guests come from Europe and NYC, so the Hampton Jitney (especially) and the LIRR are our friends. Shops, restaurants, museums, bars, ect. are all within a few minutes on foot, and there is no one I know who couldn't stand to walk a bit for their health. We use low water appliances (energy star rated) i.e. dishwasher, washing machine, ect. We have individual heating and cooling in each room, so we conserve oil, by not heating empty sections of the house. We also encourage guests to use nature's air conditioning. The breeze off the water is amazing, and really relaxes guests to a restful night's sleep. We alert guests of the Green routine, by way of showing them where they may put their recyclable refuse, and also encourage them to re-use towels, rather than waste water. Guests are very green as well, it seems, and appreciate what we are doing. As hosts and founders of Vine University, we want the wine making class to be a fun and easy time...so we have started asking guests to place their empty wine bottles in a box on the front porch. The bottles will be "recycled" by Vine U students, as each student will need 30 bottles to make their wine. It saves money, energy and it's green!